In three meditations John Claypool speaks eloquently of the wounds all of us carry through life-the wounds of grievance, guilt, and grief-and how they can be healed. The wound of grievance comes from our suffering at the hands of others, we are pierced by guilt when we inflict pain in return, and we suffer grief when we are hurt by loss. By anecdote and personal example, Claypool helps us see that all these wounds can eventually be healed through the gifts of insight, forgiveness, and gratitude. 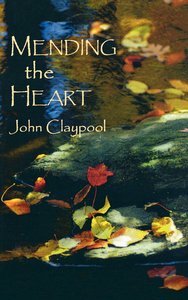 With the help of scripture and Claypool's own pastoral wisdom, Mending the Heart is a powerful tool for reflection. Each meditation begins with verses from the psalms and ends with a prayer. This book is a wise resource for pastors and caregivers, especially in times of crisis and bereavement, but its simplicity and insight also make it a good guide to prayer and discernment as well as a fine gift book. Mending the Heart is the fourth in our series of Cloister Books: smaller format, gift edition books designed for meditative and devotional reading. John Claypool was an Episcopal priest and popular teacher, speaker, preacher, and retreat leader. Initially ordained in the Southern Baptist Church, he also pastored for 30 years in that denomination. He taught at the McAfee School of Theology at Mercer University in Atlanta. He is the author of numerous books including: The Hopeful Heart, God The Ingenious, Tracks Of A Fellow Struggler and The Greatest Sermons Ever Preached.